Status: Rare regular spring migrant east, rare casual central and west. 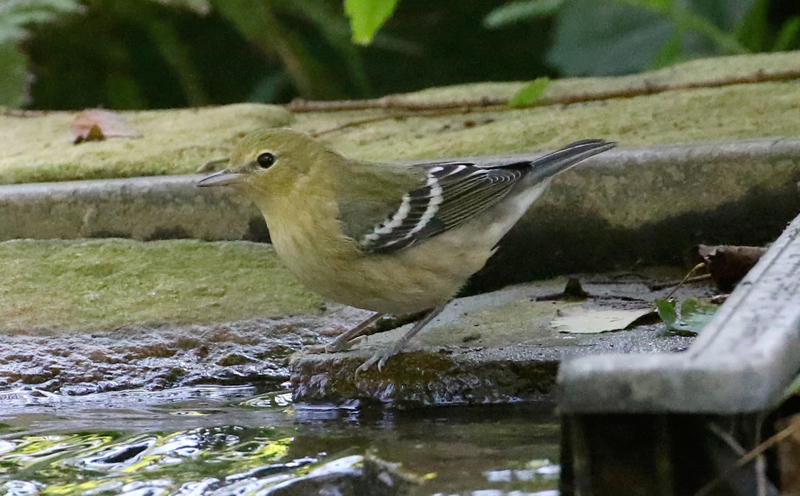 Uncommon regular fall migrant east, rare casual central and west. Documentation: Specimen: UNSM ZM10831, 14 May 1913 Lincoln, Lancaster Co.
Migration occurs in May, although there are two later reports, 19 Jun 1974 Perkins Co and 26 Jun 1957 Scotts Bluff Co (see Comments). Bay-breasted Warbler is somewhat cyclical in its spring occurrence, probably reflective of cycles in numbers of spruce budworms (Robbins 2018). In the decade 1982-91 it was reported only in 1982 and 1991, but since then it has been reported each year since 1993. In 2018 no fewer than 19 were reported 11-16 May, and 12 in 2014 during 8-17 May, compared with the previous high count of four in a season; all reports both years were from the east. Apart from the Scotts Bluff Co report above, there are these additional westerly reports: 9 May 1953 Thomas Co, 15 May 1978 Garden Co, 15 May 2005 Calamus Reservoir, Loup Co, 16 May 2004 Lake Ogallala, Keith Co, 18 May 2004 Brown Co, 20 May 2006 Valentine NWR, Cherry Co, 24 May 1997 Wheeler Co, 26 May 1978 Garden Co (Rosche 1994), and 20 May 1956 Logan Co.
High Counts: 4 at Fontenelle Forest, Sarpy Co 14 May 2016, 3 there 17 May 2014, and 3 there 12 May 2018. A total of 19 was reported in 2018 and 12 in 2014. In fall, Bay-breasted Warbler is regular in the east, in contrast to its rarity in spring. This pattern has been noted also in Missouri (Robbins 2018) and Iowa (Kent and Dinsmore 1996). In Iowa, Dinsmore et al (1984) noted that it occurs in fall in 10-fold greater numbers than in spring based on banding data, and Kent and Dinsmore (1996) noted it was “much more common in fall”. Since 1964, all fall reports except these few are from the east: 6 Sep 2018 Scotts Bluff Co (eBird.org), 8 Sep 1997 Garden Co (Brogie 1998), 15 Sep 2001 an immature female at Lake McConaughy, Keith Co, 20 Sep 1978 Boone Co, 22 Sep 2012 Dundy Co, and 9-10 Oct 1979 Howard-Hall Cos.
High counts: 6 in Washington Co 11 Sep 1995, 3 at Krimlofski Tract, Neale Woods, Washington Co 13 Sep 1998, and 3 in Washington and Sarpy Cos 16 Sep 2001. A total of 14 were recorded in Sarpy Co 14 Aug-9 Sep 1991 (Grzybowski 1992). Bay-breasted Warbler in Papillion, Sarpy Co 9 Sep 2018. Photo by Phil Swanson. Comments: The Jun reports cited above for Perkins and Scotts Bluff Cos are of interest in that they support the possibility of extralimital nesting such as has occurred in Colorado (Andrews and Righter 1992) and Manitoba (Sealy 1979), apparently in response to abundant food supplies of tent caterpillars or spruce budworms. Photograph (top) of a Bay-breasted Warbler at Papillion, Sarpy Co 15 May 2018 by Phil Swanson. Sealy, S.G. 1979. Extralimital nesting of Bay-breasted Warblers: response to Forest Tent Caterpillars? Auk 96: 600-603.